In 17th century Italy, opportunities for women to sing in public were prohibited in many spheres of daily life. But within the inner walls of the convent, cloistered nuns could raise their voices in musical praise to their Maker. 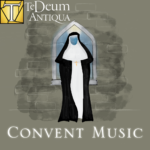 For this concert, the women of Te Deum Antiqua with Jan Kraybill playing continuo will explore the music of these cloistered nuns and the sacred riches that came from this period. No physical tickets will be issued for this performance or the VIP Reception. Your name will be on the will-call list at the ticket counter, along with the number of tickets purchased.